June 14: After eating breakfast at the hotel, Amanda and I packed our stuff into the rental car and checked out of our hotel. We did this for two reasons. First, it was Sunday, and hotel prices were falling all over the region now that it was no longer a weekend--we could afford a hotel a bit closer to the trail! And second, the further I walked along the trail, the longer the drive to get back to it! So we'd be checking out and finding a hotel closer to the trail. Amanda dropped me off at the Palisades Parkway where I continued the hike from where I left the day before. I didn't see any thru-hikers, but there were plenty of day hikers on the trail! I passed them quickly. The New York City skyline was still visible from various viewpoints, but it was much more hazy today than the day before. I could barely see it with my naked eyes, and couldn't see it at all through my camera. No more photos of NYC today! Late in the morning, I passed a trail crew building a reroute along the Appalachian Trail. 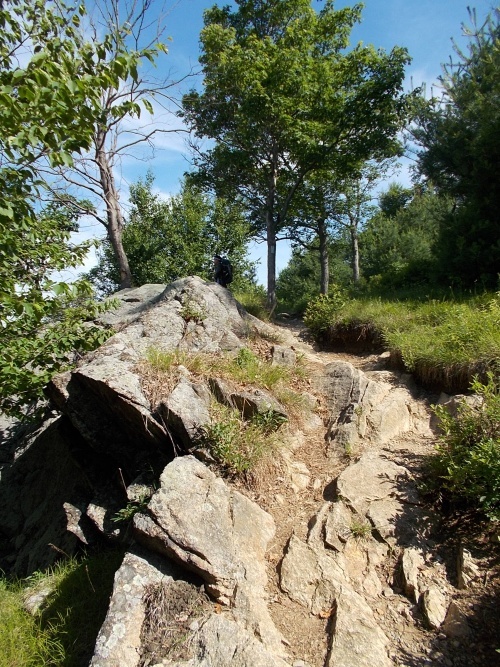 It a minor reroute, replacing a badly eroded section of trail with fancy rock steps. 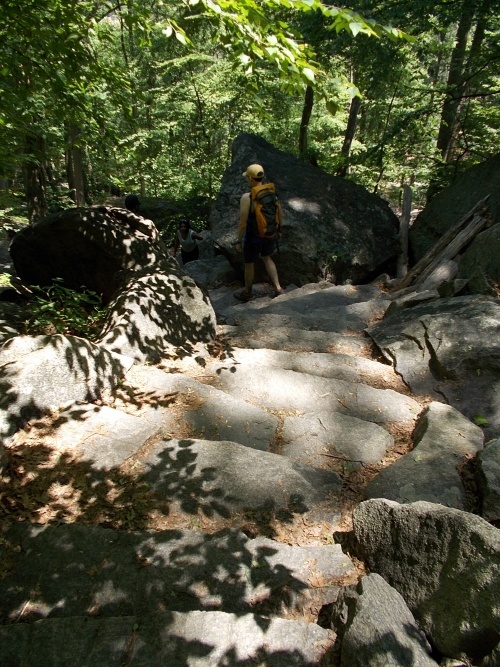 I'd learn later that much of the trail in the Bear Mountain region was being rebuilt with thousands of rock steps for the last decade or so. 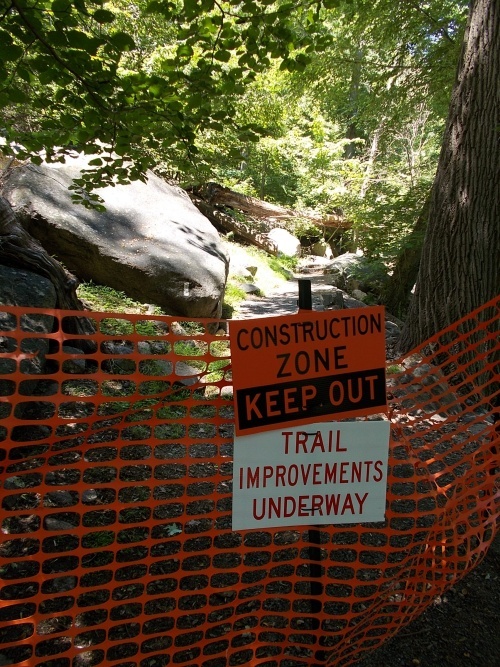 It's a high-traffic area and they've been working to create a trail that's built to last against the thousands of people who hike the region each year. 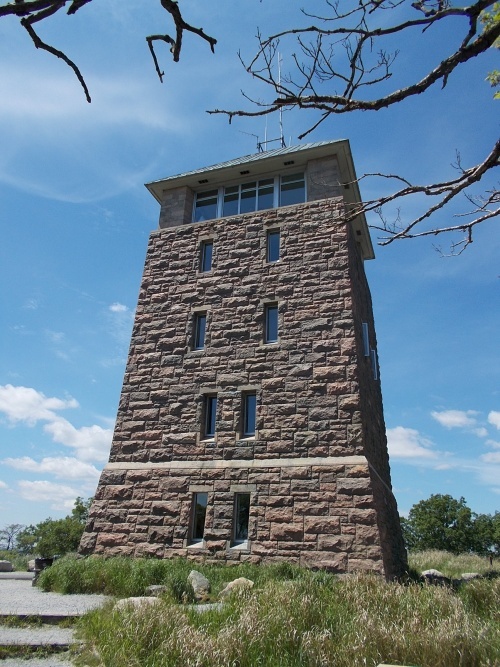 Eventually, the trail passed Perkins Tower with its commanding views of the Hudson Valley and HOLY COW there were a lot of people! Cars idled in the road, angling to get a parking spot. Hundreds of people wandered around. It felt positively claustrophobic. Originally, I intended to take a quick snack break, but I rethought that plan. Nope, I needed a little more peace and quiet. I remembered my visit through here in 2003 being relatively nice. I must have walked through then on a weekday or something. Today it was absolutely crazy! 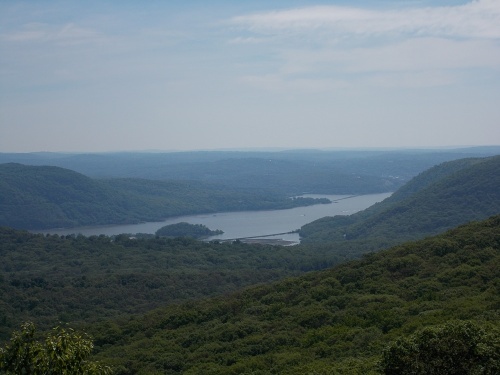 The Hudson River Valley. The NYC skyline is out there somewhere, but it wasn't really visible through all the haze today. 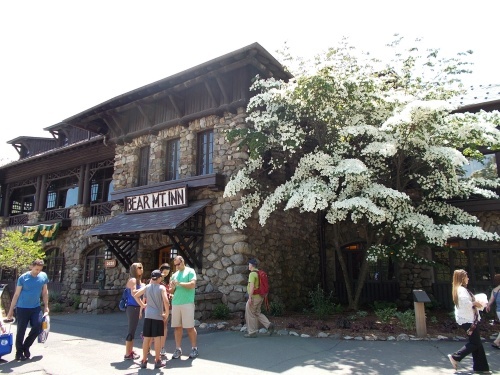 From the Bear Mountain Inn, the trail winds down under a busy road then into the front entrance of the Bear Mountain Zoo. The zoo is filled with troubled animals--injured animals that can no longer survive in the wild. It's a small and kind of sad-looking zoo, but it's a major landmark on the trail for a couple of reasons. One, the trail runs through the zoo! There is a by-pass for hikers who arrive after hours when the zoo is closed, but where's the fun in that? 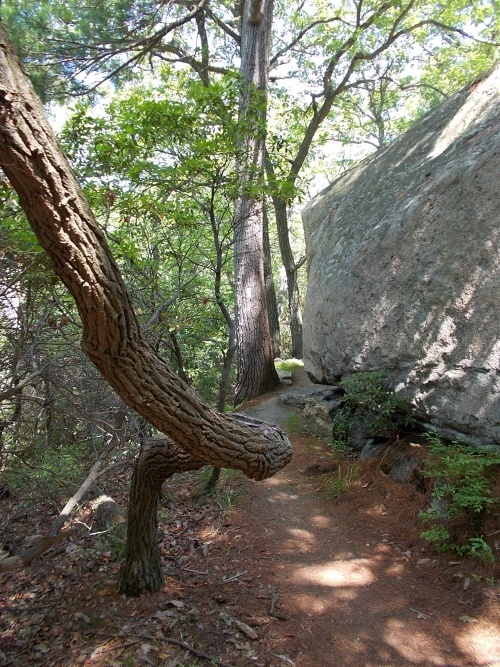 And two, the lowest point of the entire Appalachian Trail happens to be in the zoo, just in front of the bear enclosure. It's all uphill from here! And finally.... for those unfortunate thru-hikers that have managed to make it this far without ever seeing a bear, they're all but guaranteed to finally see them here in the zoo since the trail runs right past that bear enclosure. When I passed through, there were two bears lounging in the sun in the far back right corner of the enclosure. I could barely see them in their hiding place, and it didn't help that the sun was almost directly behind them. More interestingly, I thought, where the large number of vultures in the trees. They looked ready to swoop down and start attacking all of the pedestrians, but more likely, they were hoping to get some free food from the bears when feeding time came around. 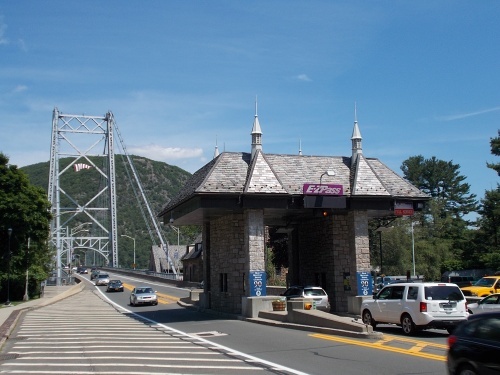 The trail left the zoo through a service entrance in the back of the zoo, almost immediately turning onto the Bear Mountain Bridge crossing the Hudson River. 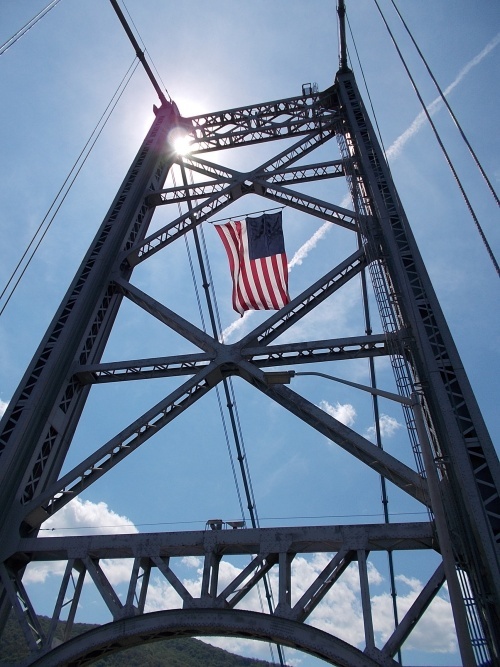 Crossing the bridge on foot is a blast, crossing 150 feet above the Hudson. It's noisy from all of the traffic on the road, but the views are spectacular! On the other side, the trail climbs steeply, and at the next trail junction, I followed a white blaze to the right. Perhaps ten minutes later, I happened to notice a blue blaze on one of the trees and realized I had taken a wrong turn. ARGH! I know I followed a white blaze at that trail junction, and had I been thinking, I would have realized it was suspicious. I had a mental map of how the trail was laid out and knew there was a trail junction, and the one to the right would lead to Anthony's Nose--a prominent viewpoint immediately above the Bear Mountain Bridge. Obviously, I was on that trail. Anthony's Nose is about a half-mile off the trail and I'd normally have been inclined to check it out, but I said I'd meet Amanda at a road crossing at a certain time and I was running a bit late so decided to skip Anthony's Nose. Now, I was already halfway there! Crap. Well, in for a penny, in for a pound. I continued on to Anthony's Nose. May as well at this point! I soon caught up with several young men who were playing music incredibly loud. Seriously? What the heck is wrong with you people?! How do you expect to ever see any wildlife playing a stereo at a volume that others can hear from a quarter of a mile away? I just wanted to hike that much faster to get away from them. Finally, upon reaching the top at Anthony's Nose, the trail came out to a wonderful viewpoint--perhaps the best of the entire day. Better than Perkins Tower. Better than from the Bear Mountain Bridge. It was just an amazing view. I took a few photos but didn't linger. I was already going to be late for my meet up with Amanda. No time to linger! The young men with the stereo music arrived a few minutes after I did but at least had the common sense to turn it off once they did arrive. 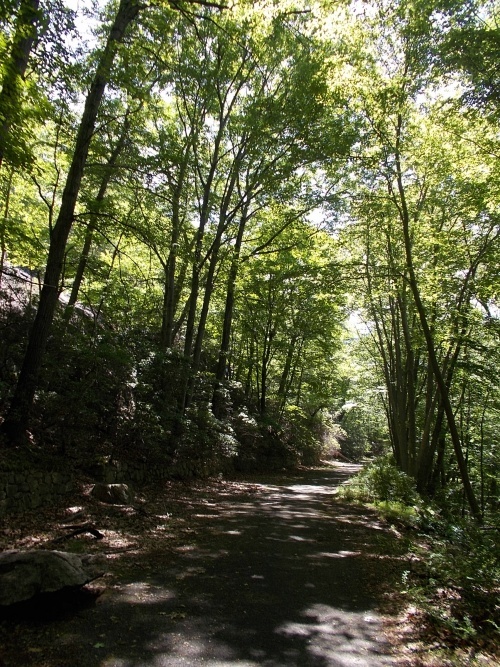 I hurried back down the mountain and along the trail. I arrived at a gravel road (Manitou Road) where Amanda was already waiting for me, arriving about a half hour later than I had projected. The detour up Anthony's Nose didn't set me back so much as the time it took me to get through the zoo because I wanted to read every sign I passed. It was the zoo that put me behind schedule! =) But Amanda must have been reading a really good book or something because she didn't even notice I was late. We checked into a motel near Killfish, ate dinner at Boston Market (which is actually a restaurant and not a market at all, and it certainly isn't in Boston! ), then went to a nearby movie theater where we watched Spy--a hilarious movie starring Melissa McCarthy going undercover for the CIA. It had a lot of really good laughs! And that was it. It was back to the hotel room for the night, where I tried to get at least a little online work done before I went to sleep! The fancy new rock steps they've been installing for a decade should weather the test of time! Amanda met me at the Bear Mountain Inn for a lunch break at a Mexican restaurant further up the road. 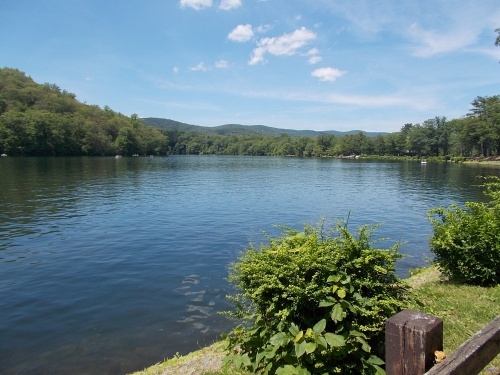 The lake behind the Bear Mountain Inn. 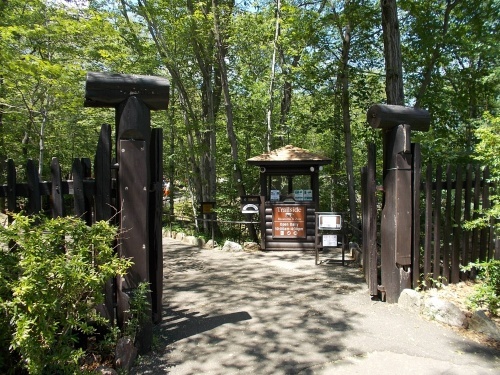 The entrance of the Bear Mountain Zoo. 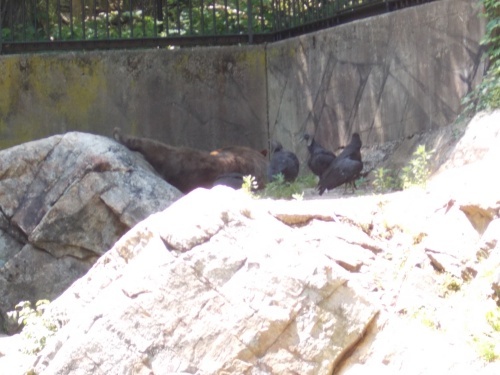 There were two bears in the bear pen, but they were barely visible by hiding themselves in the far back corner of their cage. (That brown mass of fur--that's the bear.) Vultures were everywhere! This sign is a little misleading. 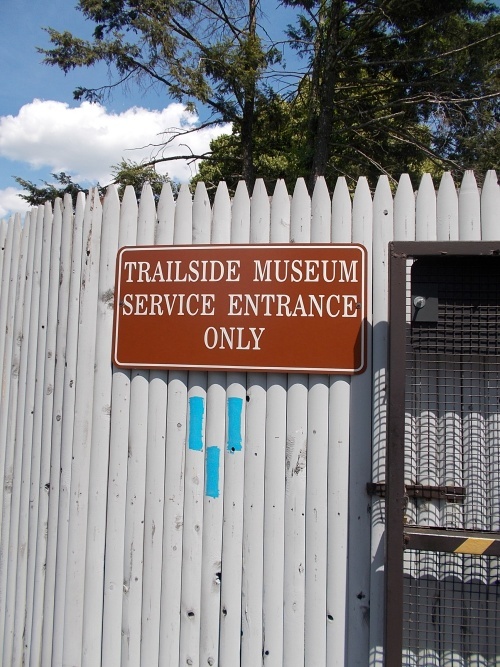 Not only is it a service entrance, but it's also the exit for the Appalachian Trail from the zoo! 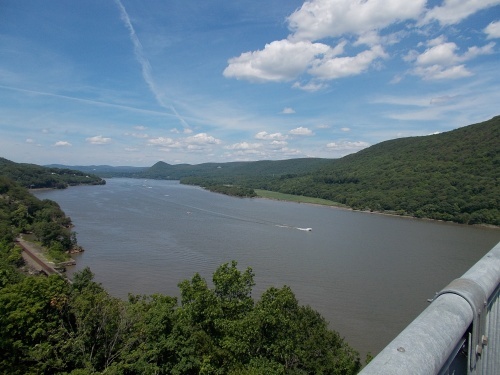 View of the Hudson River from on the bridge. View UP from the deck of the bridge. 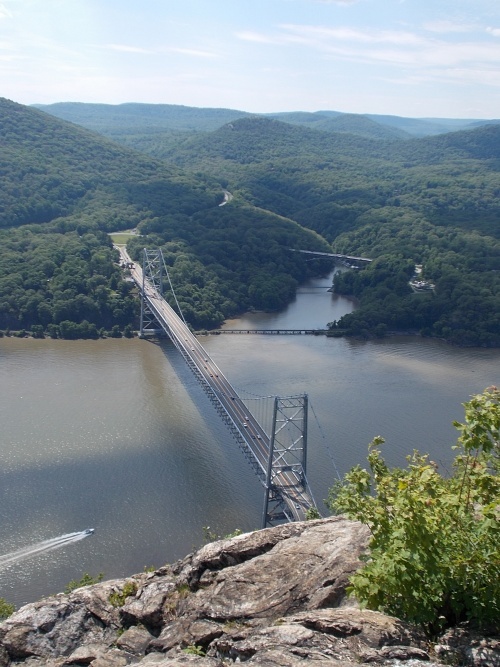 And the view from Anthony's Nose looking back down at the Bear Mountain Bridge. 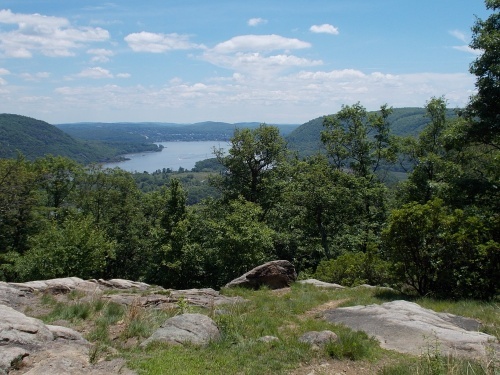 Bear Mountain was one of my favorite parts of living in NY. I found my first letterbox there. It was so pretty, except when the crowds descended.